Chili sauce can be made in many variations. There are hot chili sauces and sweet chili sauces. There are chili sauces that are fruit-based as well. Chili sauce is a condiment that adds spice and flavor to a wide range of dishes, from Asian recipes to Western favorites. It can be used as a wonderful dip for finger foods of all kinds, a side condiment to add more spice to your food, or even as a handy cooking ingredient. I’ve always wanted to learn how to make my very own homemade chili sauce. I am very particular about my chili sauces. I prefer my hot chili pepper sauce not to overwhelmingly spicy. I like the heat but not when it’s still lingering on my tongue. Anyhow, after much relentless determination, experimentation, and improvisation, I came up with the perfect red hot chili sauce recipe that is neither too mild nor require a fire extinguisher after having one teaspoon of it. Depending on what kind of chili sauce you buy or decide to make, the ingredients will vary, but not very widely. Chili sauce consists of, chili peppers, garlic, onion, and red bell peppers which are which are simmered in a base of lime juice, vinegar and sometimes tomato. In North America, there are various types of chili sauce available for your eating pleasure, including Mexican Tobasco Sauce and Louisiana Hot Sauce. Then there are Asian-style chili sauces on the other side of the world. Asian sweet chili sauces can be used with nearly anything you might be eating or cooking, including western dishes like hot wings or spicy pasta dishes. 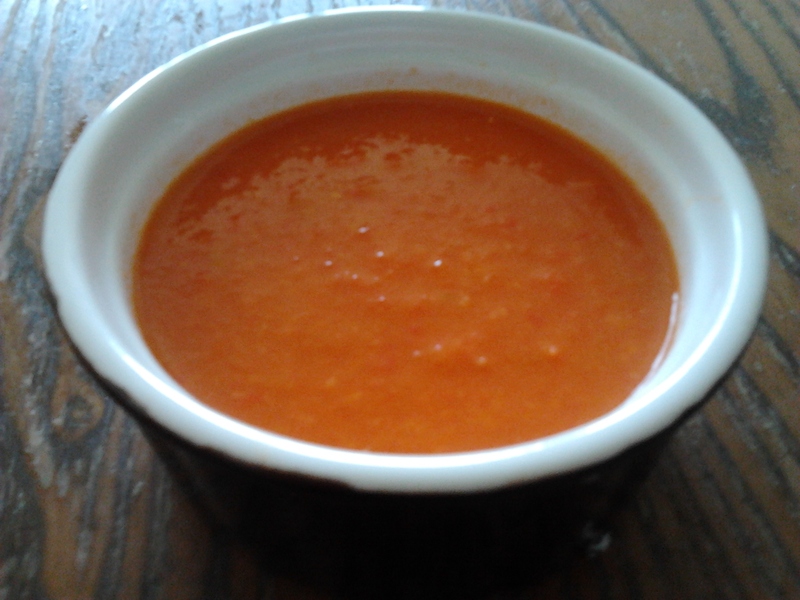 My red hot chili pepper sauce recipe is very basic and easy to prepare. You can adjust the level of spiciness, acidity, or sweetness to your liking. Heat1 tablespoon of oil in a sauce pan over medium high heat. Saute onions till translucent. Add garlic and saute for another 2 minutes. Then add the remaining vegetables and saute for another 7 minutes. Season with salt, pepper and sugar. Add lime juice, vinegar and broth. Simmer for 10 minutes or until peppers are soft and tender. Remove from stove and turn flame off. Using a a hand blender, puree till smooth. Allow the chili sauce to cool. Transfer to a jar, cover, and refrigerate when cold. This entry was posted in Gluten Free, Sauce, Vegetarian and tagged Asian sweet chili sauces, homemade chili sauce, red bell peppers, red chili peppers, red hot chili sauce. I can’t recall the last muffin recipe I published on my blog. I can’t even remember when I last baked muffins. It has been that pathetically long. All I remember is not realizing that it’s been ages since I had something for breakfast aside for oatmeal. My palate becomes accustomed to certain flavors and tastes very quickly that it craves for something different. 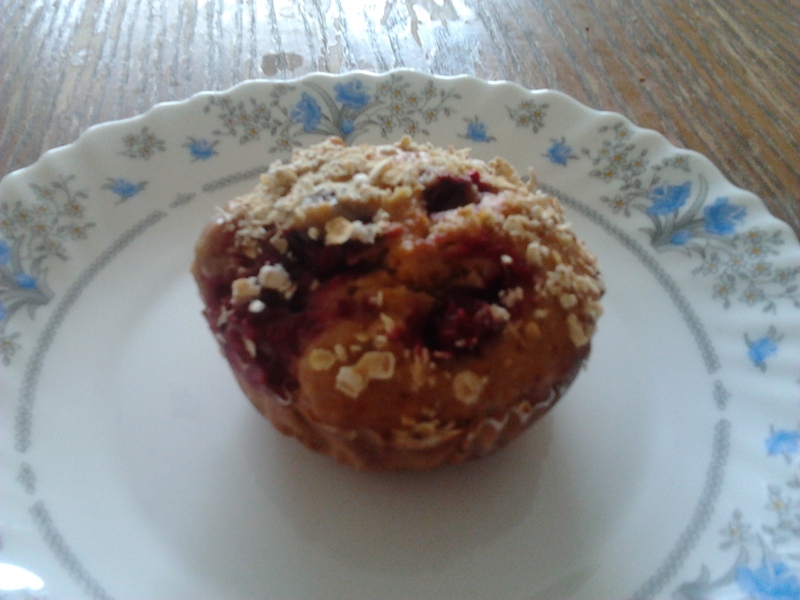 I had a hankering for muffins since I haven’t had one for a long while. After cruising through an assortment of muffin recipes online and in cookbooks, there was one muffin recipe that piqued my interest. I modified some of the ingredients and recreated a sugar-free version. The combination of orange and cranberries allow the sweetness and tangy flavors to collide into one another. I didn’t notice that I had frozen cranberries sitting in my freezer all this time and they recently came in handy for this cranberry orange muffin recipe. I would have used fresh cranberries if I had access to them. I used freshly squeezed orange juice and orange zest to enhance the flavor. While a lot of muffin recipes require copious amounts of butter and oil, this does not. With only 5 tablespoons of corn oil, 1/3 cup of pure honey, orange juice, and cranberries, this moist, low fat low calorie, dairy-free and sugar-free muffin recipe is a must-have at every breakfast table. Especially at my breakfast table. Some people like to add crushed pecans or walnuts or use rolled oat. I used neither but you can throw them in if you choose to. For a celiac-friendly adaptation, you can use oat flour or barley flour for this muffin recipe. These cranberry orange muffins can be enjoyed while still warm, or when cool. They are best the day they are made, but are still very good the next day. Preheat oven to 375 F. Line a muffin/cupcake pan with paper liners. In a large bowl add the first 5 ingredients and whisk together. Make a well in the center. In another bowl, beat eggs, oil, orange juice, honey, orange and vanilla extract together. Pour wet ingredients in the flour well and mix well. Don’t overmix. It should still be a bit lumpy. Fold in cranberries. Scoop batter evenly into prepared muffin/cupcake pan. Sprinkle rolled oats on top of each muffin (optional). Bake muffins about 20 minutes (test with a toothpick, there should be moist crumbs, but not wet). Cool in pans for 10 minutes before removing to wire rack. Serve warm or at room temperature. Leftovers can be stored in a sealed container and should be consumed within 48 hours. Or you can freeze them. This entry was posted in Breakfast, Vegetarian and tagged cranberry orange muffins, frozen cranberries, muffin recipes, orange juice, orange zest, sugar-free. Fresh juice is a special treat for me as it’s seldom available. It helps me kickoff my morning aside for coffee. I am normally not a morning person but a cup of cold fresh juice is tends to brighten my mood just a tad. 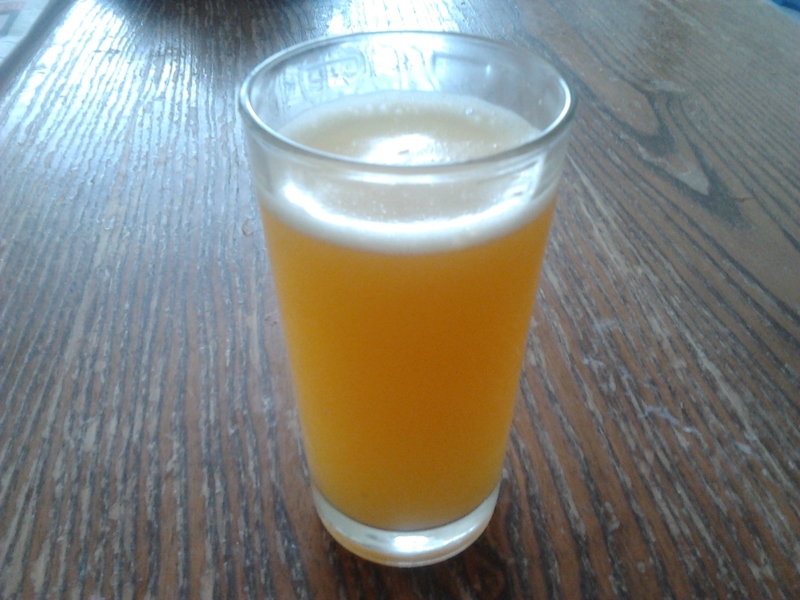 I wanted to spoil myself just a bit and make my own fresh citrus juice. Made of fresh red grapefruit, yellow grapefruit, and oranges, this citrus juice is bursting with Vitamin C and beta-carotene, as well as lycopene. Revered as fruits from paradise, citrus fruits are known for their unique health-promoting as well as disease-healing properties, especially among health-conscious, fitness freaks. This morning citrus juice is not only impact in flavor but it also delivers a heavy nutritional punch. This refreshing and bright drink with a bit of “zing” really grew on me. I felt too lazy to juice all these citrus fruit manually so I just removed the peels and skin and blended them. I left a bit of pulp in the juice but you can completely strain it if you choose to. Peel and skin citrus fruit. Remove seeds. Place fruit in the blender and blend till smooth. Strain pulp using a sieve. Transfer juice to a pitcher and refrigerate. Serve chilled. This entry was posted in Breakfast, Drinks, Gluten Free, Vegetarian and tagged beta carotene, citrus fruit, citrus juice, nutritional punch, oranges, red grapefruit, vitamin C, yellow grapefruit. I may love my meat but it’s hard for me to resist a vegan, gluten-free, and nutritious meal. I’ve mentioned on my last post that I will be focusing on vegan dishes for the next couple of days. Spaghetti squash came to my mind. I lugged a couple of spaghetti squashes from a health supermarket out of the area. I sometimes have a bad habit of buying something on a whim but anything I purchase always gets used sooner or later. When cooked, the squash flesh shreds into threads like thin spaghetti or vermicelli, hence its name. On average, spaghetti squash measures about 12 inches in length and about 6 inches in diameter. The squash should be an even light yellow color and firm with no bruises. Although spaghetti squash has a bland flavor, it is sometimes seasoned with spices and herbs or served with a sauce. Spaghetti squash is a brilliant way to increase the amount of vegetables in your diet. Plus it’s a great low-carb alternative to rice, pasta, and potatoes. Of all the food that you’ve overindulged in, I bet that your mother never complained to you about eating too many vegetables. Spaghetti squash can be utilized in many ways. There are many variations of spaghetti squash recipes but I decided to incorporate a stir-fry version and it worked perfectly. This vegetable stir-fry recipe consists of Chinese vegetables and roasted spaghetti squash. Although this recipe is strictly vegan, you can add chicken, lean beef, or tofu for a protein rendition. Toasted cashew nuts are another option as well. Regardless of the additional ingredients you choose to use to enhance this dish, this vegetable stir-fry with spaghetti squash recipe makes a low calorie and satisfying meal that even pasta-lovers (such as myself) can enjoy. Preheat oven to 400 degrees F. Bake spaghetti squash rind side up for 40 minutes or until flesh is soft. Scoop the seeds and fibrous strings from the center of the cooked spaghetti squash. Gently scrape the tines of a kitchen fork around the edge of the spaghetti squash to shred the pulp into strands. Set aside. For the vegetable stir-fry, combine the last 5 ingredients together in a cup or bowl. Stir well to dissolve the sugar. Adjust the flavors to suit your taste by adding more lime juice if too sweet or salty. Warm a wok or large frying pan over medium-high heat. Add 2 tablespoons of oil and swirl around, then add the Chinese vegetables. Stir-fry for 7-10 minutes or until vegetables are soft. Add 1/4 cup of stir-fry sauce at a time as the vegetables are cooking. Remove vegetables from heat and toss them in with the spaghetti squash. Add cashews or sprinkle chopped green onions on top if you like and serve. 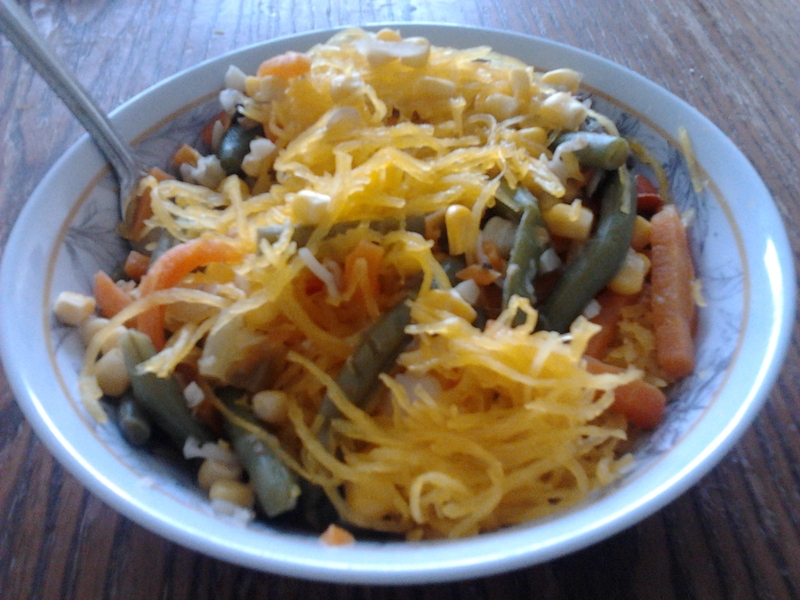 This entry was posted in Gluten Free, Vegetarian and tagged Chinese vegetables, low carb, spaghetti squash, vegan dinner idea, vegetable stir-fry. After eating a meat-heavy meal over the weekend, I think I will be concentrating on vegan (and gluten-free) meals for the next couple of days. This phenomenon normally results from having more of my share of meat. You can eat too much meat or dairy but there is always an endless appetite for something light such as a vegetable oriented meal. One of the biggest complaints or matter-of-fact statements I receive from people about vegetarian meals is that they are never filling leaving people very hungry. Another complaint is that they are bland and overrated. Even as a carnivorous meat-eater, vegetarian meals can be exciting and flavorful depending on how it is presented and seasonings you use. Not all vegetarian meals are heavy on soy as rumors may sometimes have you believe. While cauliflower seems to be the star for this dish, other components that bring this dish together are spinach, potatoes, and almonds. Curry is also another highlighted ingredient in this vegetarian dish as it is meant to give the vegetables an orange hue as well as flavor. As one of the other spices used in this dish, turmeric is a natural antiseptic and antibacterial agent, useful as a disinfectant like any ordinary wound burns. Its roots as well as leaves have long been used in traditional Indian and Chinese medicines for their demonstrated anti-inflammatory, anti-oxidant, and anti-cancer properties. When used in cauliflower as it is in this recipe, turmeric has been shown to prevent prostate cancer and stop the growth of existing prostate cancer. I absolutely crave nuts with almost any vegetarian dish and almonds are just the perfect marriage. If you have a nut allergy (I know too many people who do), you can just simply omit them. If you are looking for a vegan and a gluten-free meal idea that is very tasty and easy to make, I have just the recipe for you. This curried cauliflower, spinach, and potatoes are a flavorful vegetarian meal that will appease both vegans and meat-eaters alike unless there is a disgruntled member in the audience with a passionate aversion to cauliflower. I try to use recipes that will pacify everyone but pleasing everyone all the time is a nearly impossible task. If you don’t like cauliflower, feel free to use any other vegetable of your liking. Squash may work for you. It’s just a suggestion. Cook potatoes until softened. Heat pan and saute cauliflower and onions until beginning to color. Add the potatoes to the pan. Then add spices and chopped garlic to pan and heat gently for 30 seconds. Throw in spinach and chopped tomatoes. Pour in 2 cups of water or vegetable broth and cook till vegetables are soft and tender. Season with salt and pepper as needed. Serve hot garnished with toasted almonds. 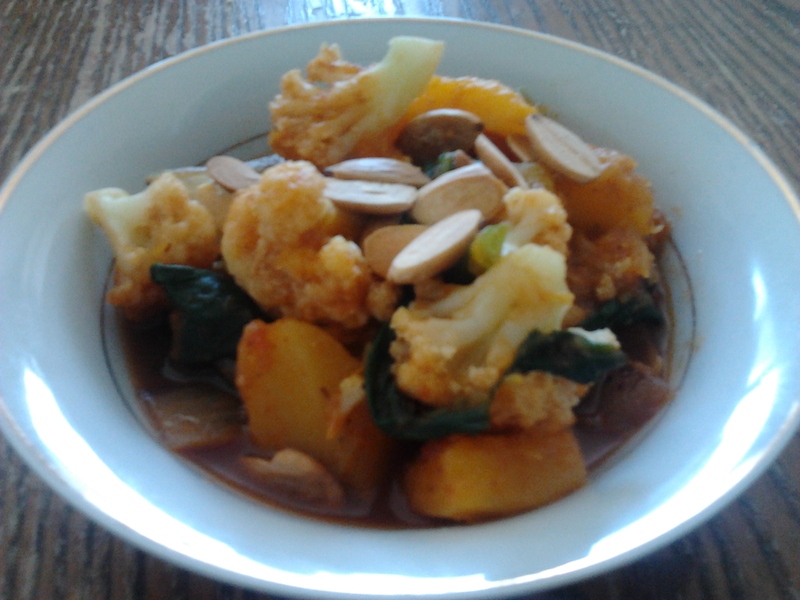 This entry was posted in Gluten Free, Side Dishes, Vegetarian and tagged cauliflower, Curry, potatoes, spinach, turmeric, vegetarian, vegetarian dish. I was in the mood for something light and easy on the stomach for dinner one night. Plus I wasn’t feeling up to making anything gourmet or complicated for that matter. Cauliflower kale quiche fit the bill for me. I am normally not too enthusiastic about eating cauliflower but I wanted to try something different. As a kid, I avoided cauliflower like a plague. Later, I’ve learned that all it needed was a bit of seasoning to drown out the bitter flavor to make it edible. And that’s what I’ve been doing ever since. I suppose eating cauliflower every now and then wouldn’t kill anyone. But I’ll never have the stomach to eat cauliflower raw unlike some of the people I know. Kale enhances the flavor of this crustless quiche. If you don’t like kale, spinach is always an available option. This recipe was very convenient for me as it did not require a pastry pie crust. A whole lot of effort and labor is not required for this low carb cauliflower kale quiche. And its not very heavy on dairy. I used low-fat cottage cheese and a bit of milk. This flourless quiche is really easy to prepare, yummy and healthy which can also be adapted as an appetizer or breakfast. I made it in a large pie dish, but you can use a muffin tin as well and make mini-quiches. Serve this cauliflower kale quiche with whole grain rice and some salad for a complete meal. Top this quiche with cornflake crumbs for an extra crunch. Fill a large pot with water and add basil, chopped onion and minced garlic and heat until it boils. Then and cut apart cauliflower (toss the leaves) into large florets. Place cauliflower florets into boiling water and wait for it to re-boil. Then turn heat to medium and cover and let it cook for about 20 minutes or until the cauliflower is relatively soft. Preheat oven to 375 (or 350 if you plan to use a muffin tin). In a blender combine kale, eggs and cottage cheese,milk and blend until smooth. Once the cauliflower is done, drain it and in a large bowl mash it up using a ricer. Mix in the blended mixture. Season with salt and pepper. Grease an 8 inch pie dish with cooking spray and pour in cauliflower kale mixture. Top with cornflake crumbs. Bake for 30-35 minutes (if using muffin tin check it after 20 min). Serve hot or cold. This entry was posted in Dairy, Gluten Free, Vegetarian and tagged cauliflower kale quiche, crustless, Dairy, kale, low carb, Quiche. Brownies cookies are one of my favorite cookies. Sadly, I had difficulties perfecting them. I tried changing the ratio and using different ingredients. This time, it was a smashing success. Like most brownie cookies, these cookies have the same fudgey and chewy consistency without the extra saturated fat and sugar content. Plus they are not as caloric. 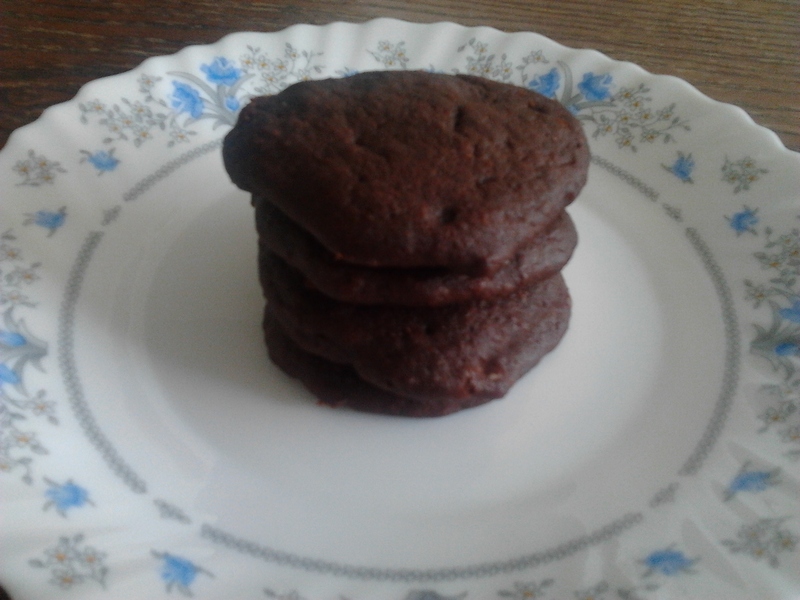 Heck, these brownie cookies don’t contain any eggs making them completely vegan. But unlike most cookies, the technique involving making these brownie cookies requires a couple of hours of refrigeration prior to baking them. The reason for that is to allow the dough to solidify; making them easier for you to form cookie balls. This method only applies if the batter is too watery. You can even make this batter a day in advance and refrigerate it overnight. These chewy brownie cookies are one of my easiest dessert recipes. How complicated does making cookies need to be? These vegan brownie cookies are easy treats that scream for a cold glass of milk. And it’s entirely possible to make them gluten-free too! These cookies barely lasted a day. In a large bowl, mix together the applesauce, flax seeds, pureed beans, oil, sugar and vanilla until smooth. Sift in the remaining ingredients (not including chocolate chips) and stir until a dough forms. Fold in the chips. Refrigerate for 6 hours or until solidified. Preheat your oven to 350º and line two baking sheets with parchment paper. Roll the dough into about 1 1/2″ balls and place them on the cookies sheets, at least 2″ apart in case of spreading. Bake for about 10 minutes. FOR THE LOVE OF GOD, DO NOT OVER-BAKE!!! Over-baking these cookies would be a crying shame now, wouldn’t it? Brownie cookies are not meant to be hockey pucks. This entry was posted in Desserts, Vegetarian and tagged brownie cookies, chewy brownie cookies, easy dessert recipes, vegan brownie cookies.